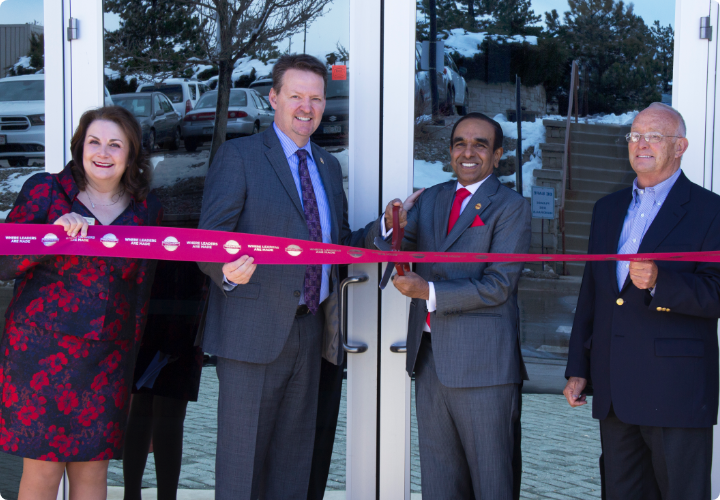 ENGLEWOOD, Colo., March 19, 2018 /PRNewswire/ -- Toastmasters International, the global organization devoted to communication and leadership skills development, has opened its new World Headquarters at 9127 South Jamaica St. in Englewood. After outgrowing its previous World Headquarters in Rancho Santa Margarita, Calif., Toastmasters International considered many different sites. The organization's Board of Directors chose the Denver metropolitan area because it offers access to a talented workforce in a cost-efficient business environment. "Southern California has been Toastmasters' home for 93 years; it will always be a part of our history and legacy," says Toastmasters Chief Executive Officer Daniel Rex. "The move to Englewood signifies a new opportunity to maximize resources, more cost-efficiently support our 16,400 clubs in 141 countries and continue to extend our reach globally." At 106,575 square feet, the new space is nearly double the size of Toastmasters previous World Headquarters and is expected to provide the organization with adequate space for 25 to 30 years. Toastmasters expects to fill more than 60 positions at the building over the coming months. "Toastmasters is a welcome addition to the Metro Denver region," says Sam Bailey, Vice President of Economic Development for the Metro Denver Economic Development Corporation. "The organization is well-established as the global leader in communication and leadership development, and we are thrilled that Toastmasters has selected Metro Denver as its new home." Toastmasters will hold a ribbon-cutting ceremony at the Englewood building on March 19 at 1 p.m. MT. The media is invited to attend. For more information about the Englewood location or to interview Toastmasters Chief Executive Officer Daniel Rex, email Dennis Olson (dolson@toastmasters.org).